WHAT DO BREEDERS CHERISH IN A FOUNDATION FEMALE? We selected our foundation females from a herd of over 500 at Pan American Alpacas located on San Juan Island in Washington State. Each stood out from the crowd with their elegant lines and presence but those were not the qualities we came to know and cherish. The most important quality in a production Dam is milk supply and mothering instinct. No one wants to bottle feed or worry about a hungry cria. Crias require their mother’s milk for at least 3 months for survival but generally over 6 months to give the cria a great start in life. 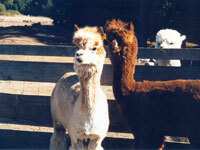 We feature two of our foundation Dams here, Cuncullane’s Cutie Pye and Sedona Poeoyo. These Dams had more than adequate milk for their crias. Their offspring gained weight very fast and quickly became large sturdy crias. Cutie Pye’s milk supply was astounding and each one of her females have the same sizable udder and overabundance of milk. These gals could have fed 2 to 3 cria each on their own. All of our Dams have been excellent, attentive and protective Moms, none have rejected their cria. Longevity of production is the next quality a breeder should seek. 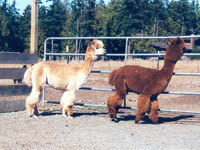 You want a Dam that can produce healthy cria year after year. These 2 females produced, produced and reproduced some more. 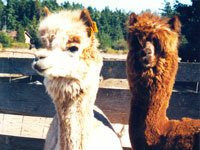 Each has given us 10 healthy cria in their lifetimes. All those babies, and not one arrived with a genetic or congenital defect. These females stood the test of time, were hardy, sturdy gals that did not succumb to the stresses of pregnancy or time. Year after year, they each produced offspring and year after year they held up and did it all over again and again. These Dams had great mouths; that is, correct bites, strong teeth and jaws, never once needing their teeth floated. The ability to nourish oneself with a great set of choppers directly affects life span and continued longevity. After milk supply and longevity of production are achieved, breeders should then concern themselves with fleece qualities and conformation. These 2 foundation females were very correct conformationally, as can be seen from their photos. Cutie Pye was a very, very fine fleeced animal, maintaining this fineness throughout her lifetime. Sedona also remained fine throughout her life and she was our queen of color, the daughter of a renowned Rose Gray. 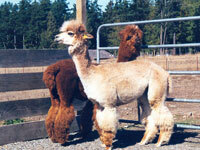 She produced Dark Fawn to Bay Black crias and a few Multi’s. 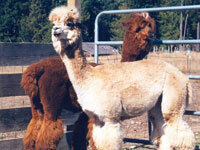 Each female produced show winning offspring at halter and in fleece. With our best females, each year we carefully selected Herd Sires from outside breeding programs located across the country that enabled us to bring in new diverse bloodlines. We are now combining these great bloodlines and producing fine bulky fleeces in a rainbow of color. Our females are the foundation upon which we stand today and our future is without question exciting and brimming with possibilities. Choose your females carefully, ask questions and do your own research.